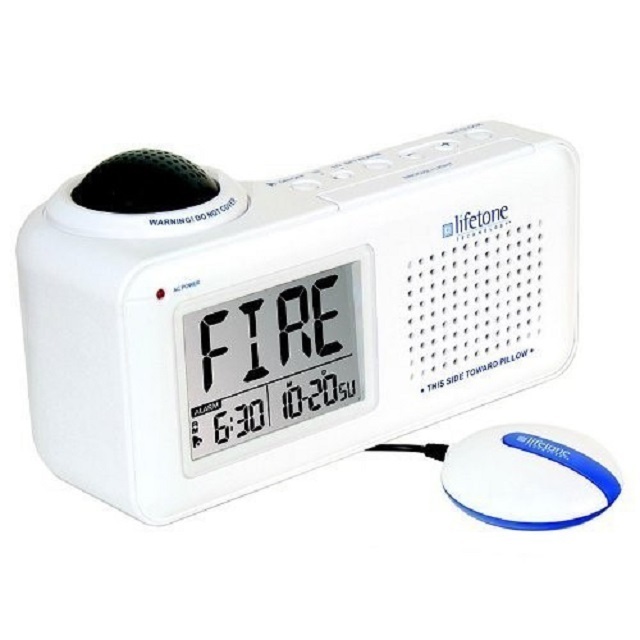 This recall involves the Lifetone HLAC151 Bedside Fire Alarm and Clock, an assistive alerting device intended for in-home use by individuals with hearing loss. It is to be placed in a nighttime sleeping area next to the bed. The white, rectangle clock measures 21.6 cm (8.5 inches) wide by 10.7 cm (4.2 inches) high by 11.4 cm (4.5 inches) wide. The fire alarm and clock has "Lifetone" printed on the front of the unit and a digital display with the date, time, and type of emergency. There is a large black dome-shaped microphone on the top left of the alarm. This recall involves units with a production date of July 2016 with serial numbers ranging from AC160600001 through AC160604102 and production date of March 2017 with serial numbers AC170100001 through AC170106030 only. The serial number is printed on the left side of the silver sticker on the bottom of the unit. The UPC code for this product is: 899142002009. Following installation, the HLAC151 display screen and optional user attached tactile bed shaker can cease to work as a result of a manufacturing defect. The optional bed shaker and the display screen are the only functions that are affected. The product's ability to detect an emergency signal, to broadcast its own lower frequency (520 Hz) emergency signal and the English and Spanish audio message, "FIRE GET OUT", are not impaired. As of December 1, 2018 the company has received no reports of incidents or injuries in Canada. In the United States, the company has received 83 incident reports of alarms with a blank screen and no reports of injuries. Approximately 286 units of the affected product were sold in Canada and approx. 9,382 units of the affected product were sold in United States. The recalled product was sold in Canada from November 2016 through September 2018. Consumers should immediately stop using the recalled product if the digital display is not working (ie. 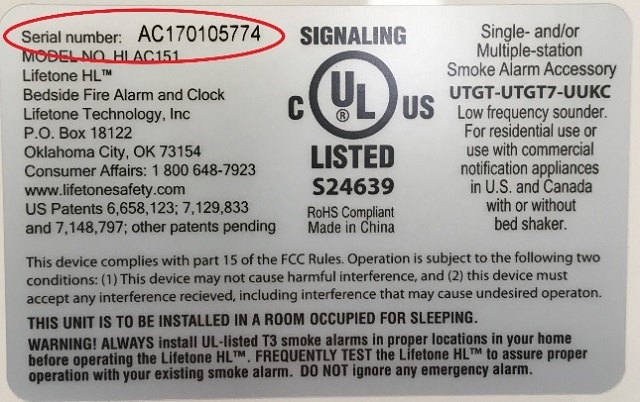 if consumer notices a blank display screen) and contact Lifetone Technology to receive a prepaid label for the return of the alarms and instructions on receiving a free replacement alarm. For more information, consumers may contact Lifetone Customer Service Department at 1-800-648-7923 from 9:00am to 5:00pm CST Monday through Friday, or online.